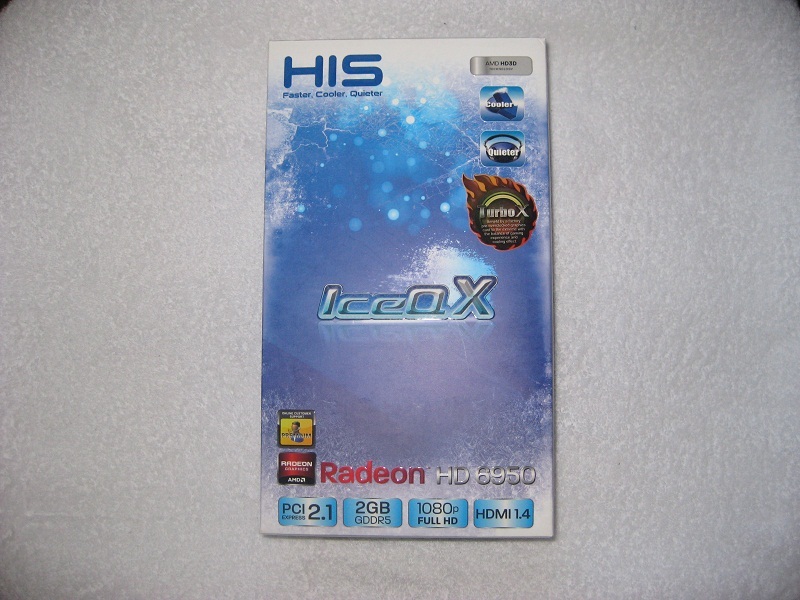 Hightech Information System Ltd., or HIS, has given us a chance to review their Flagship 6970 IceQ Turbo and 6950 IceQ X TurboX. 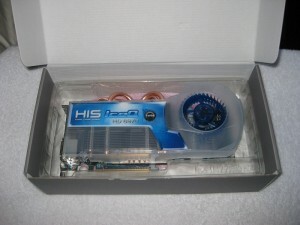 HIS has decided on significant factory overclocking and their own IceQ coolers on these versions offering a more powerful card than the reference clocked versions while running cooler, and quieter. Lets take a look at the cards. 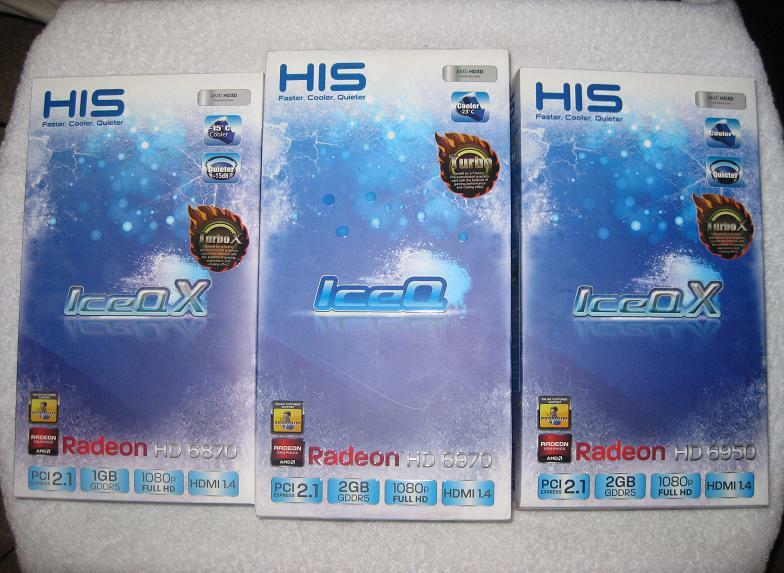 HIS Holy Trinity of IceQ Turbo and Turbo X cards. 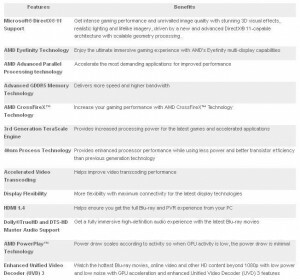 All the cards tested have been out for quite some time, so I wont go in to much detail on the technical features or specs outside of the high level items. 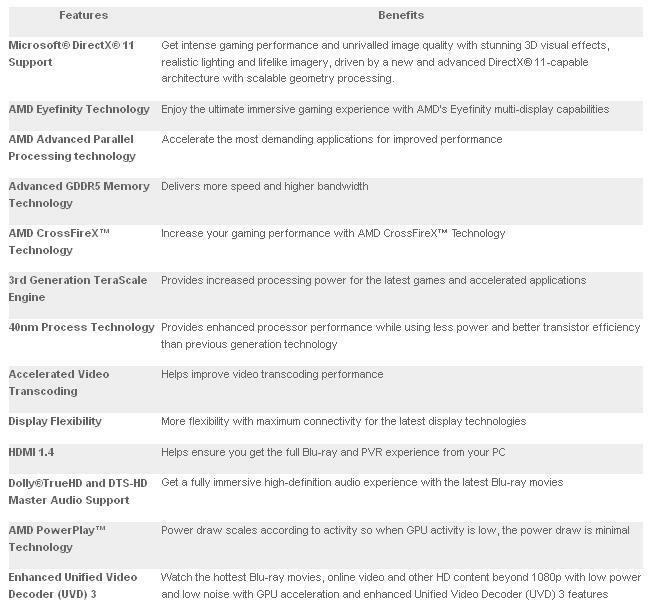 The specifications of the both the 6950 Turbo X and the 6970 Turbo are in the images below. 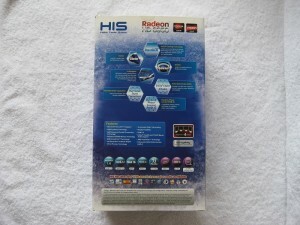 You will note all cards have a much higher core speed and memory from its reference card elders, like the previously reviewed AMD HD 6950 and Sapphire HD 6950. 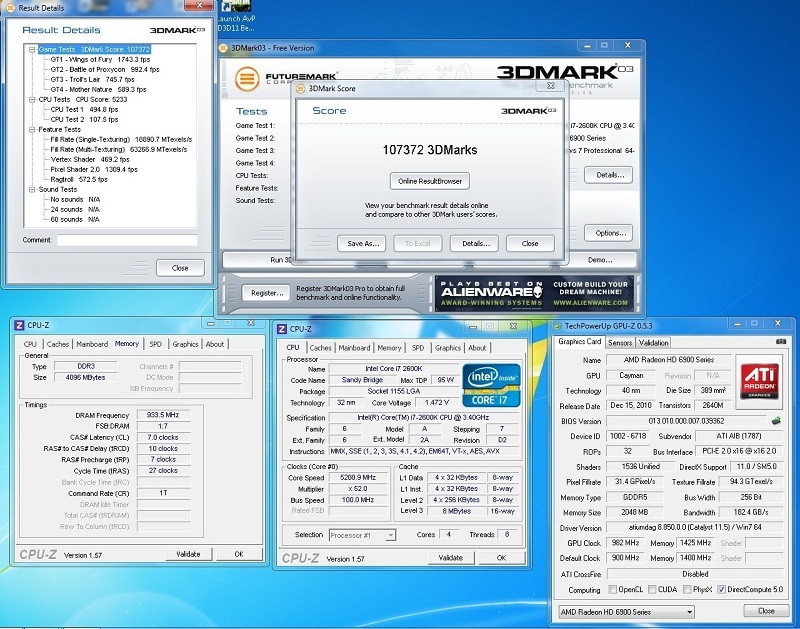 The 6950 Turbo X has the highest factory clocks at 880 MHz core and 1300 MHz vram out of the cards listed on Newegg. 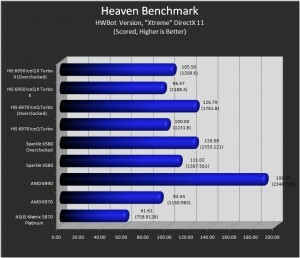 The 6970 Turbo on the other hand is in the middle of the pack with its 900 core. 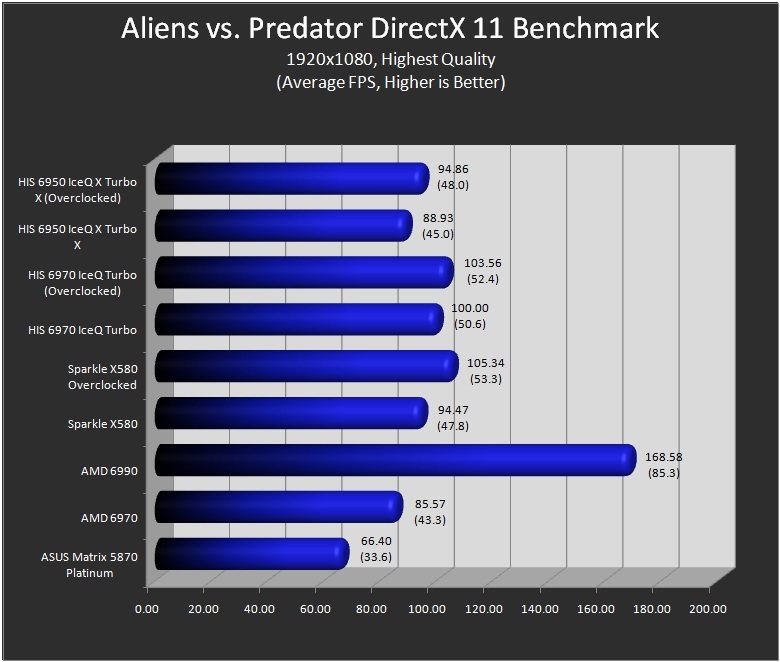 Its 1400 MHz memory speeds are the highest with a couple other brands. 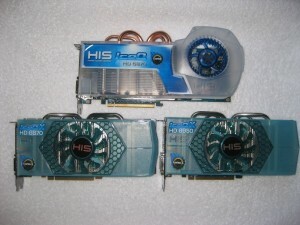 Outside of the significant factory overclocking are the coolers on these cards. 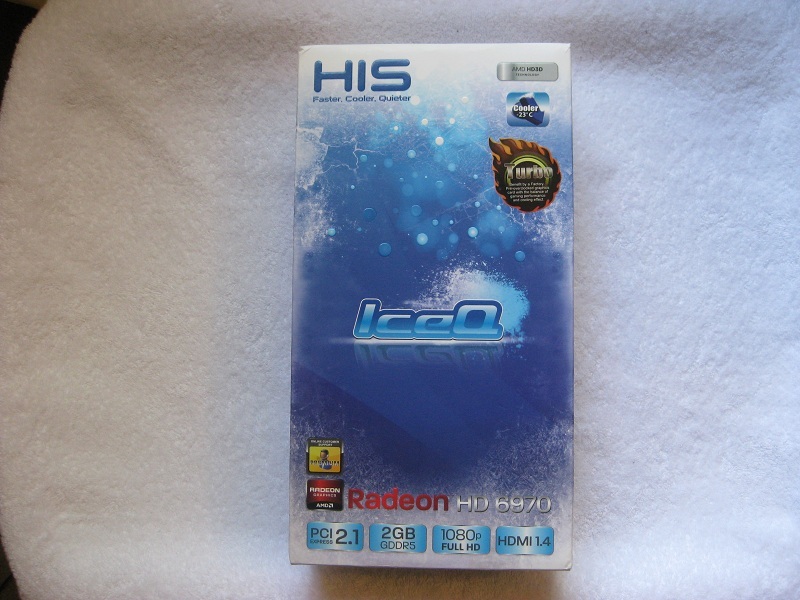 Since 2003 on a 9800 Pro, HIS has used the IceQ name for its own aftermarket cooling solutions. Fast forward to 2011 and you have their latest version of the IceQ heatsinks. 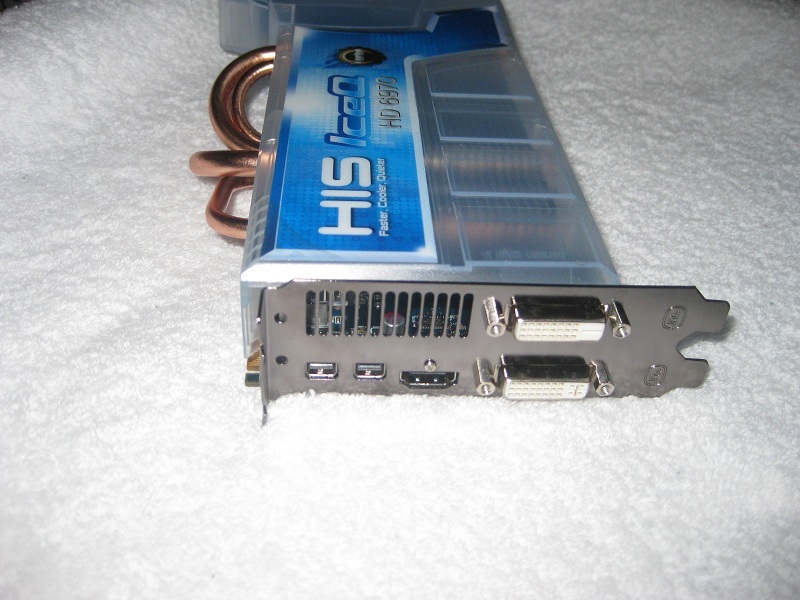 On the 6950 (and 6870), they use a 92mm fan blowing down on an aluminum four heat pipe heatsink that disperses most of the exhaust inside the case. 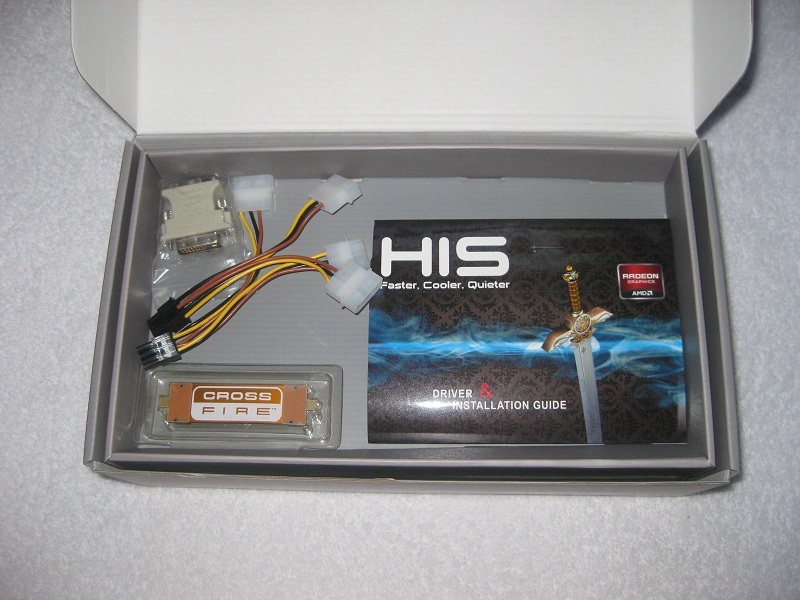 Make sure you have good airflow inside your case as with all cards that general exhaust internally in a case, CPU temperatures may change a bit. HIS oriented the fan to blow the air down onto the card and out the front and rear for the most part. Leaving these little overclocked power house’s fans on auto I could barely hear them at idle. While gaming (BF:BC2) the fan ramped up to around 65% and temperatures didn’t break 60° C in a 23° C ambient room. 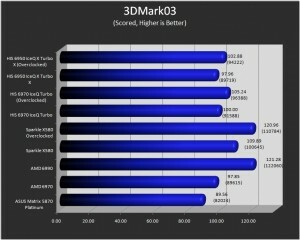 When benchmarking both the 3Dmark and game benches, I was in the same ballpark peaking around 60° C. All said, nice and quiet, and cool without touching a fan profile. I am not used to that from some of my recent cards I have to admit. 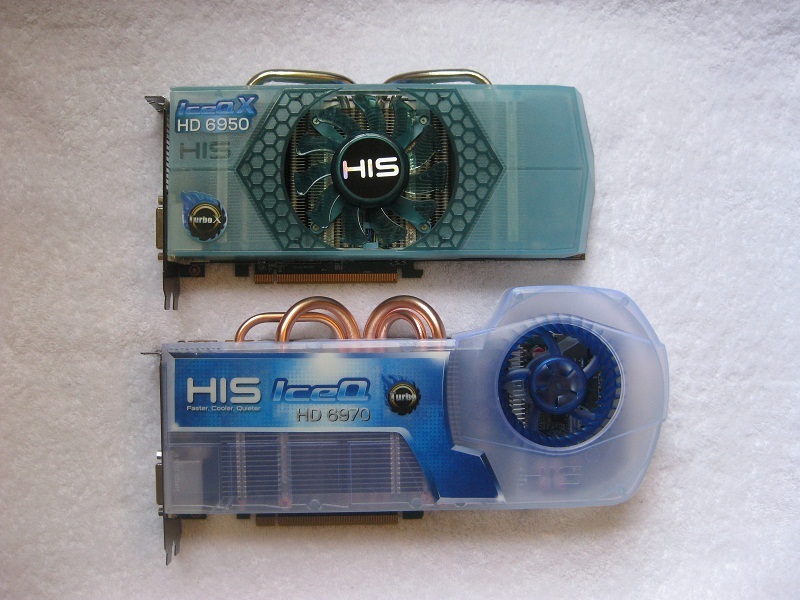 6870 and 6950 IceQ cooler (image from HIS website). The 6970 on the other hand has a more traditional blower type fan but with a more robust aluminum heatsink and four large copper heat pipes arching out past the PCB. And while its not quite as quiet as its IceQ little brother’s cooling, it’s still notably more quiet than its reference counterparts. This cooling solution exhausts the majority of warm air outside of the case, which is optimal. However there are some side vents on the heatsink cover that allow some of the warm air to release inside the case. Temperatures while gaming (again BF:BC2) barely broke 60° C on this unit with the fan ramped up to around the same speed also (65%). This blower style fan was louder than the 6950, but that’s not difficult to do versus those other fans. To put it quite simply in the cooling department, the IceQ coolers deliver on its promises of better and quieter cooling performance. These coolers, especially the version on the 6870 and 6950 are quiet up to around 75% fan speed, after that, its certainly not loud at all, especially when compared to cooling solutions on the reference boards. Having this extra cooling capacity is great for the enthusiast crowd allowing for more headroom, temperature wise, for overclocking. The only concern is that I prefer the coolers exhaust all the heat outside of the case to keep the case temperatures down. When using cases with proper airflow this really will not matter, but to some in the enthusiast crowd, every degree Celsius counts on every component, while to others its a non-issue. 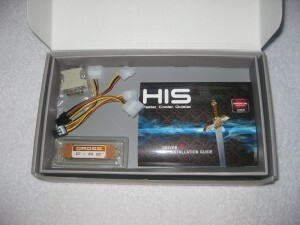 Below we will take a look at the packaging and the actual cards. 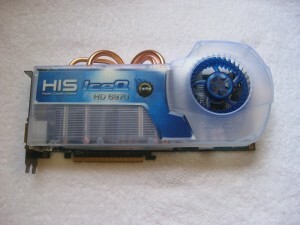 HIS 6970 IceQ Turbo inside its home! 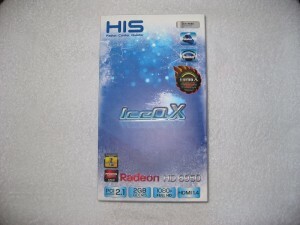 HIS 6950 IceQ X Turbo X in its packaging! I wanted to show all of the cards together, and then one shot of the 6970 next to the 6950. 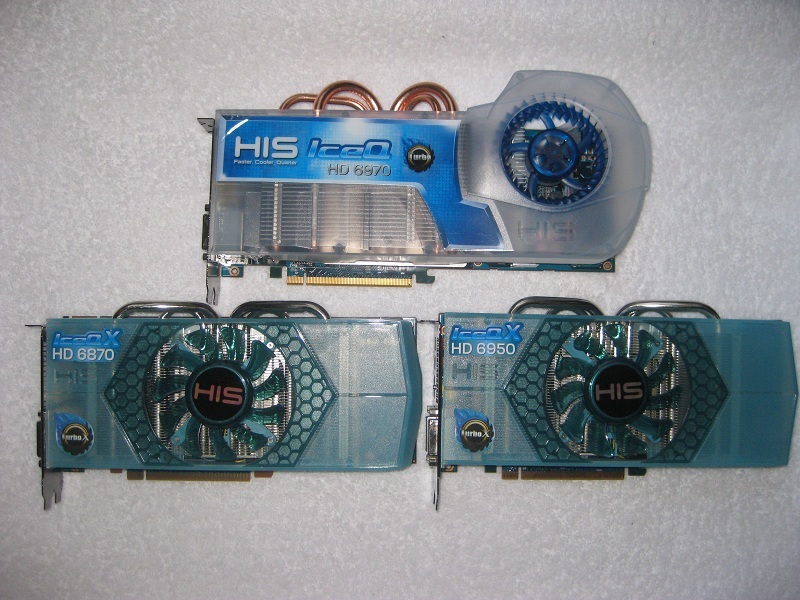 Note what a large card the 6970 IceQ Turbo is compared to the 6950 IceQ! Overall I do like the appearance on these cards. They are not flashy at all. 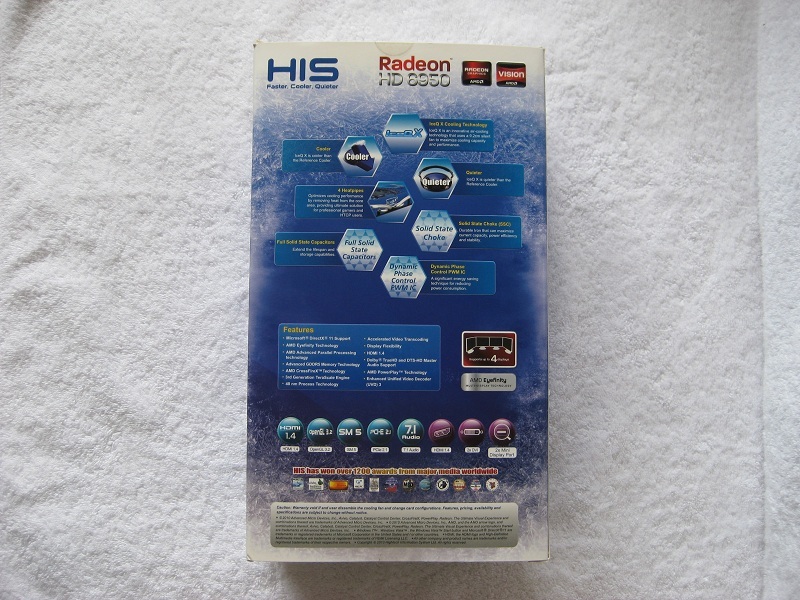 No pretty women stickers gracing these covers, just a nice translucent ice blue cover (in which the 6970 reacts under UV light) for the heatsink with blue fan for the 6870/6950 with a bit of business showing in the way of the heat pipes. The 6970 just means business to me and begs to be pushed hard with its four copper heatpipes on display. 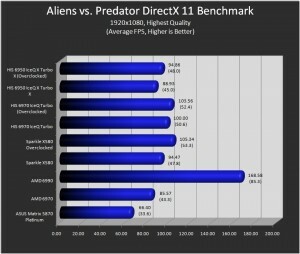 All Synthetic benchmarks were at their default settings. Alien vs. 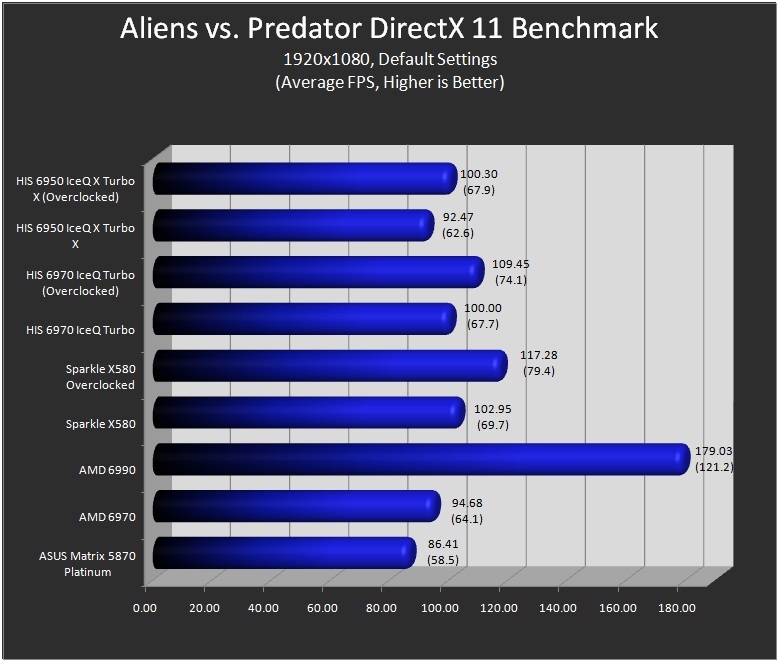 Predator was run at its default setting, and the highest it offered (4xAA, textures set to “3”). Alien vs. Predator, High Quality, 4xAA. Stalker:COP - 1920x1080, Ultra, 4xAA, Tessellation - Sunshafts. 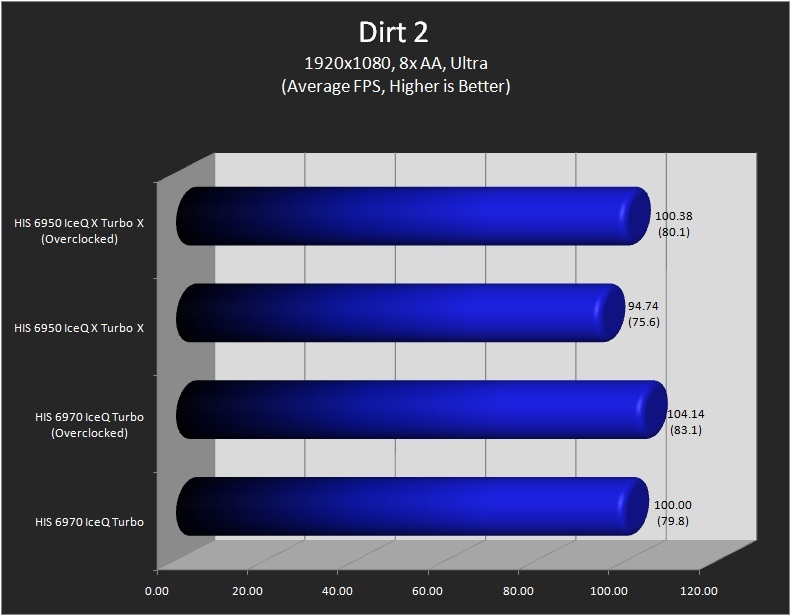 Dirt 2 - 1920x1080, Ultra, 8xAA. 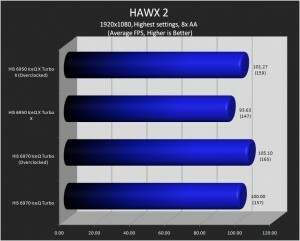 Hawx 2 - 1920x1080, High, 8xAA. As you can see from the datasets above, the cards fall in line with its natural order. The 6950 comes in just behind the 6970. 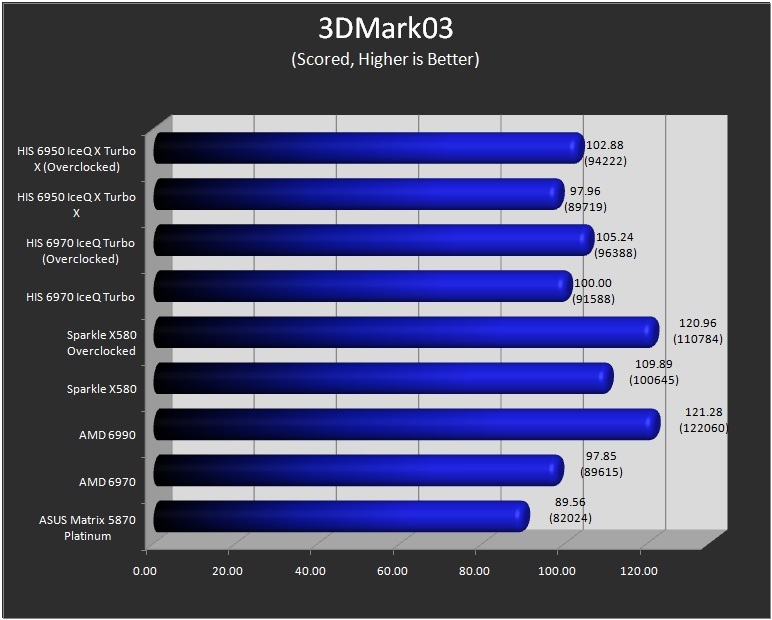 As expected, the 6970 does fall a bit short of the 580 in most tests. 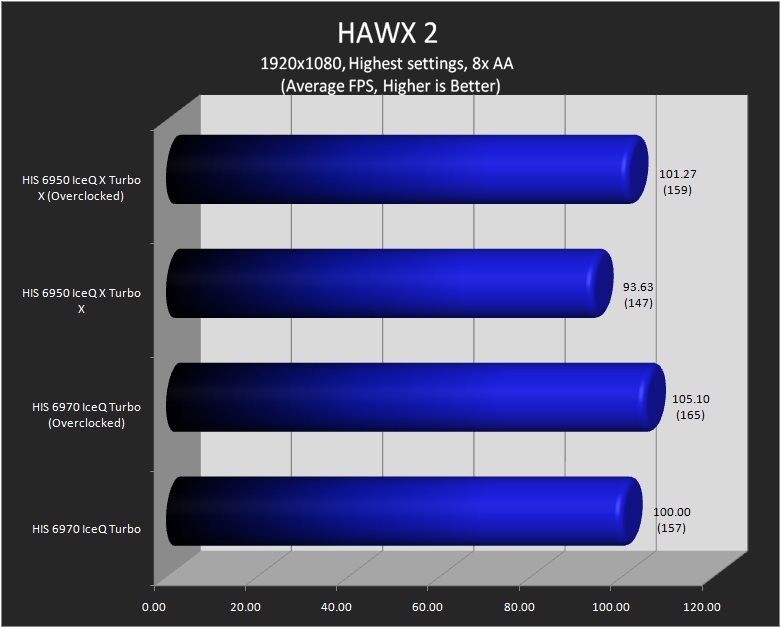 That doesn’t mean the 6970 isnt a power house pounding on any game with your choice of AA. 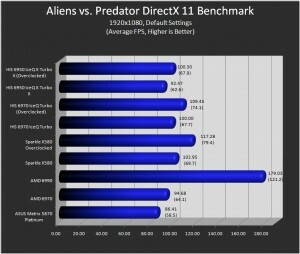 With the healthy overclocks from reference speeds on all cards out of the box, they are sure to beat their stock clocked counterparts. 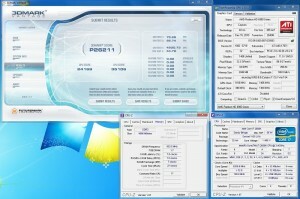 For overclocking these cards, I did end up pushing a bit of voltage to them. 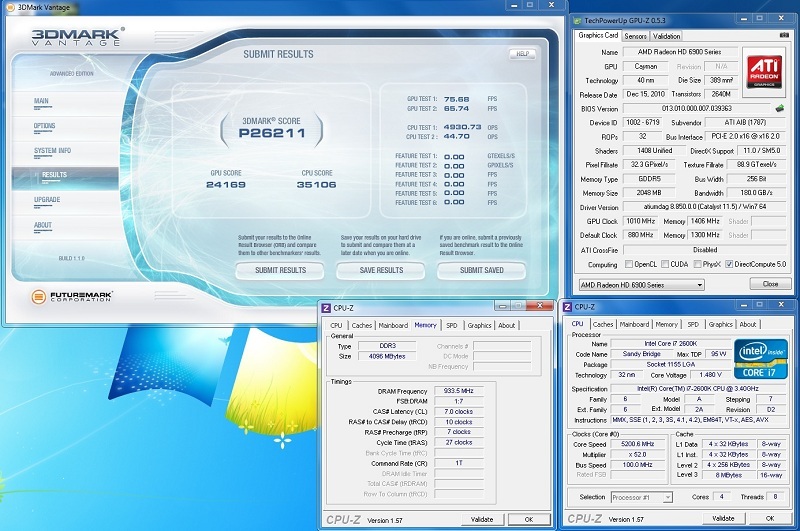 The 6970 responded well with up to a 1000 MHz core speed that was stable across most benchmarks I ran. 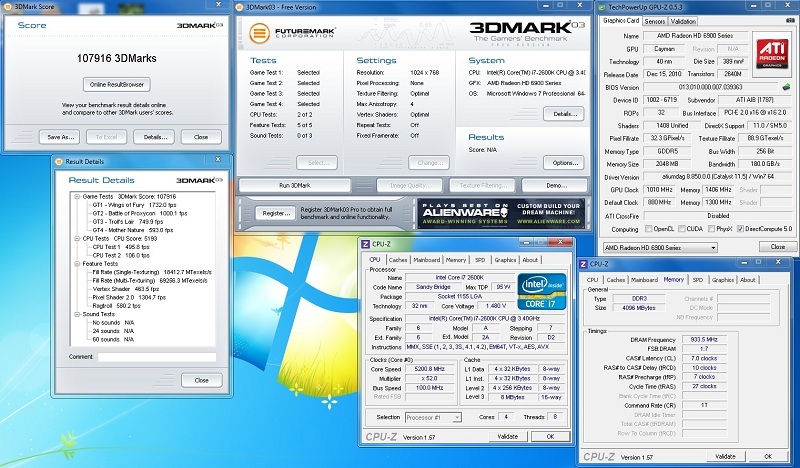 The 6950 also had some good headroom coming in at 1000Mhz core and 1400Mhz memory. We saw some pretty healthy increases from already overclocked cards which was nice to see. 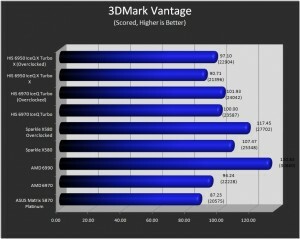 One thing I should mention is that the original HIS 6970 we had for a review just stopped working on me at 950 Core with no voltage modifications. HIS promptly requested the sample back for testing and shipped out the one you see here. 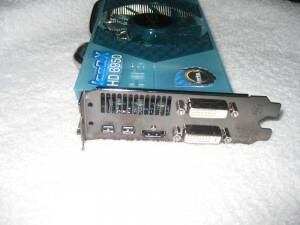 This one had no such problems and I pushed that card even further as you will see below. I would have to imagine this was an anomalous result as a quick search around the web turned up no issues like this with the card. The real story however is the cooling HIS has put on these cards. Though my testing is subjective and not based off decibels, I can tell you the 6950 (and 6870) are the quietest cards I have owned in quite a while that were not watercooled. 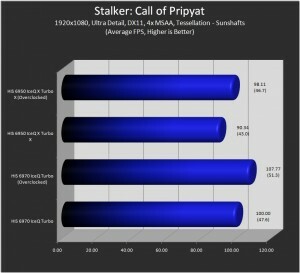 I let the default fan profile do its job and never had a complaint about the fan noise, or the temperatures. 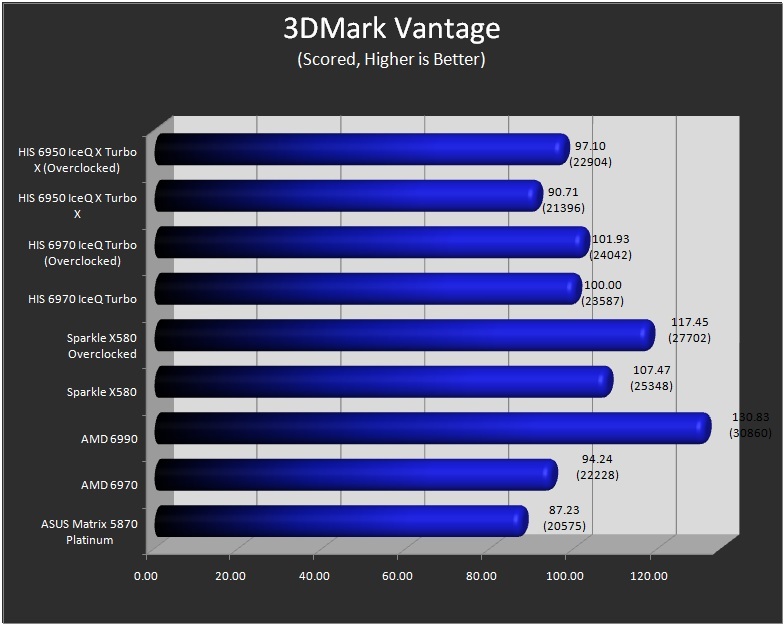 On all cards they just barely broke 60° C even when overclocked. 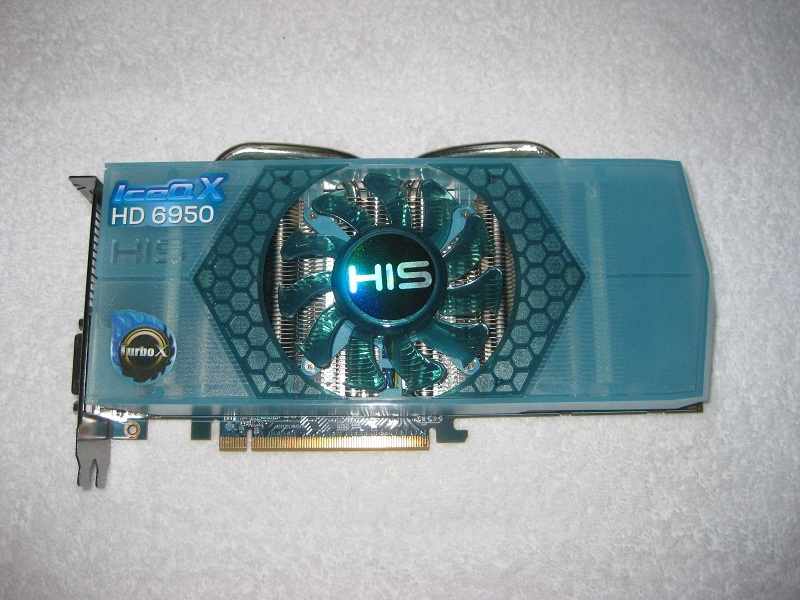 The 6970 was also more quiet than reference version/cooler even with the similar blower type fan on it but was the loudest out of the group though. I could barely hear any of the cards over my five 120mm Yate Loons at 1000 RPM. It looks to me like the IceQ cooling has done its job of keeping things cool and quiet, and done it well. 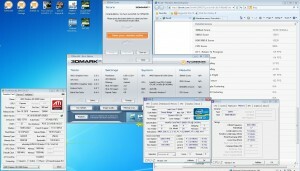 Below are some screenshots of the 6970 benching and clocking up the i7 2600 to 5.2Ghz. 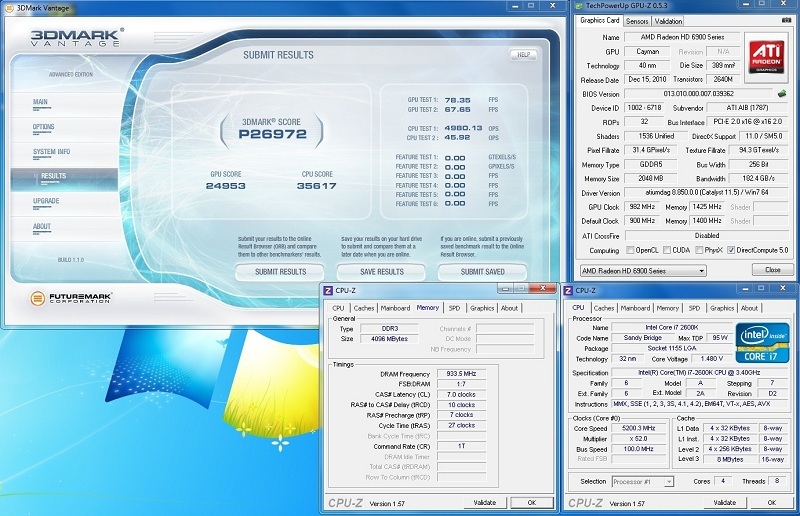 I was able to achieve a respectable 1000 core clock and 1425 memory with the 6970 Ice Q Turbo in most benches with 1.26v. 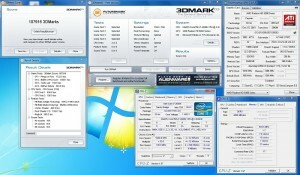 The 6950 with Sandybridge flexing its muscle. 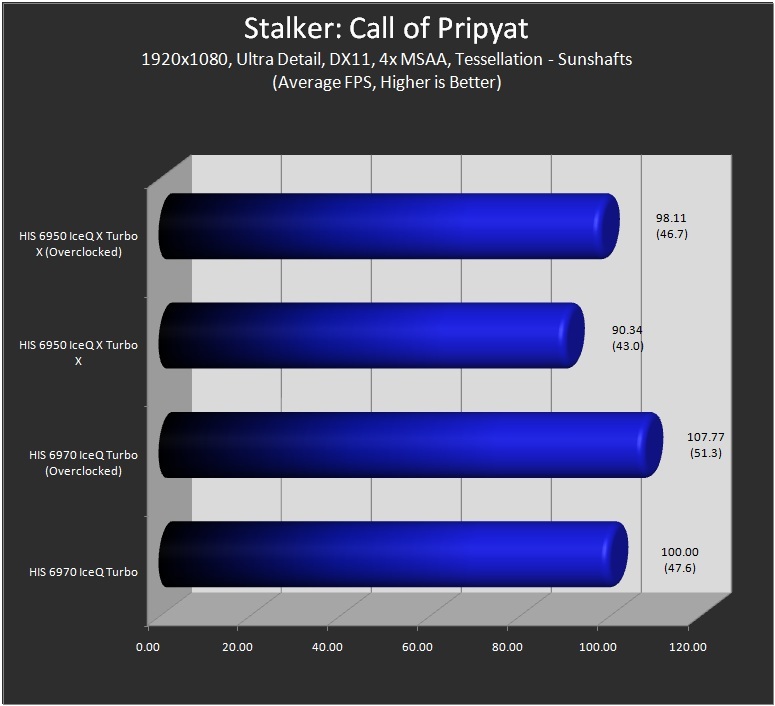 With the Trixx overclocking software, I was able to push this card to 1000Mhz core and 1400 memory which was a nice overclock for sure. I did change the voltage to 1.265 for these runs. There seemed to be some left in the tank too. 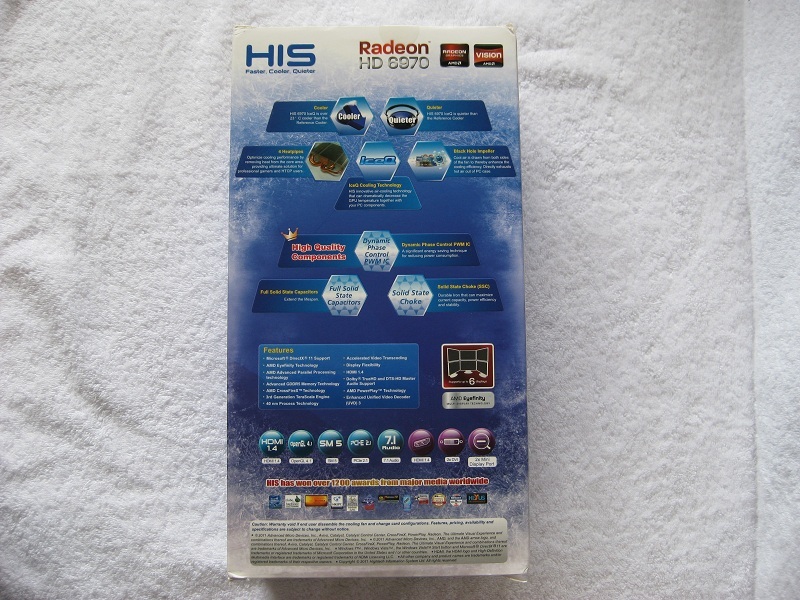 It was nice getting back to the AMD side again. 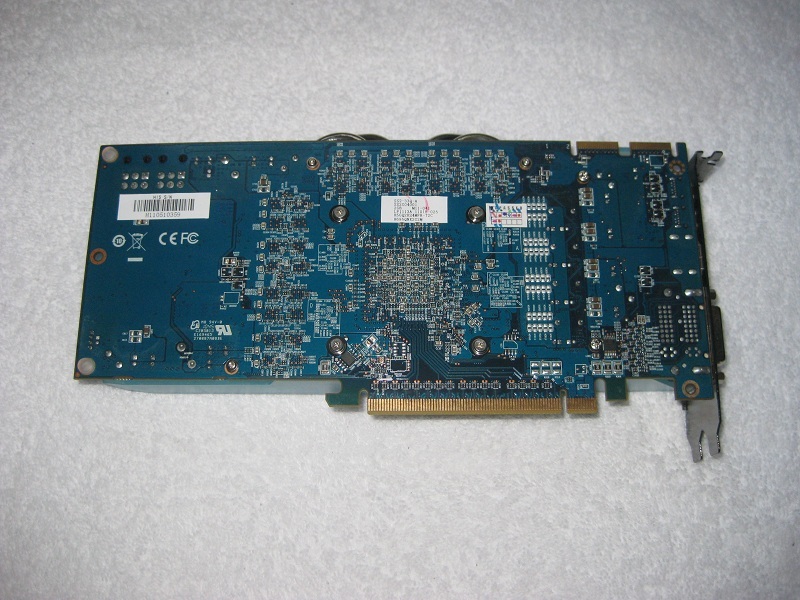 I had knocked off the rust a bit doing some benching work with a 4870, but really never had an opportunity to play with the 5 or 6 series cards. 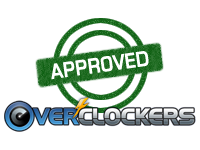 The overclocking software was a little different but the concepts were the same. The cooling solutions used by HIS in these IceQ cards are a very good upgrade from reference offerings. 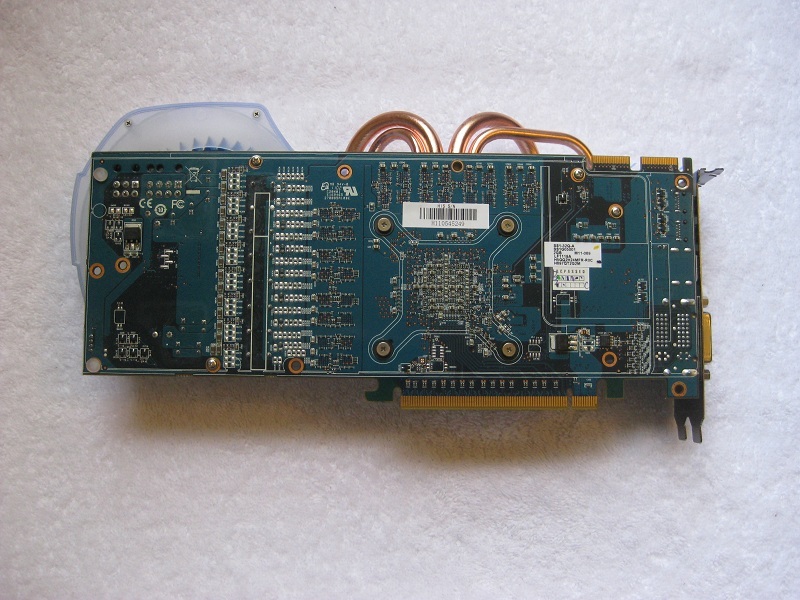 The lower temperatures and noise are both welcome additions to today’s video cards. 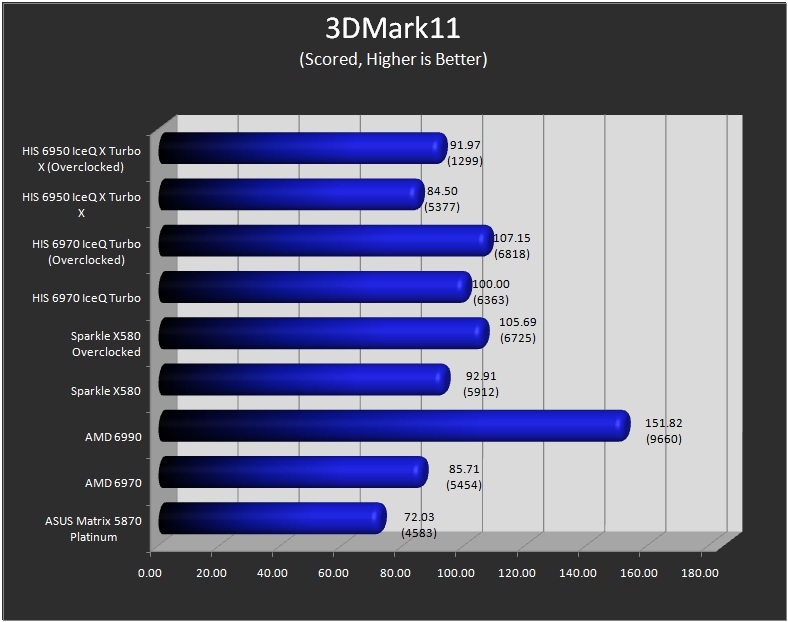 Being an enthusiast, it was nice to see such solid cooling performance. 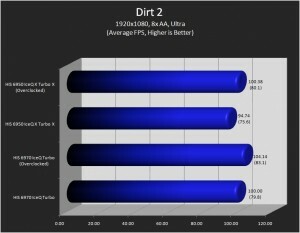 This allowed me to get some pretty hefty overclocks on both cards. 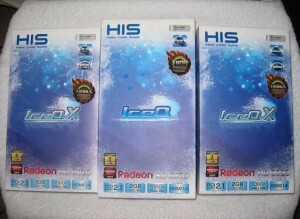 Pricing of these cards at the time of publication are as follows: HIS 6950 IceQ X Turbo X $299.99, and HIS 6970 IceQ Turbo $369.99. 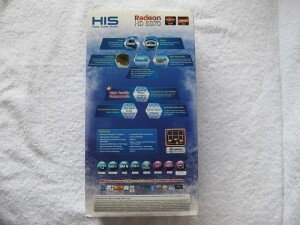 I have to say the most attractive pricing out of these cards has to be the 6970 Turbo. 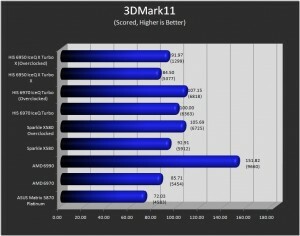 At $370, it has the 2nd highest factory overclock of all the 6970’s at Newegg and has a great cooler with it. 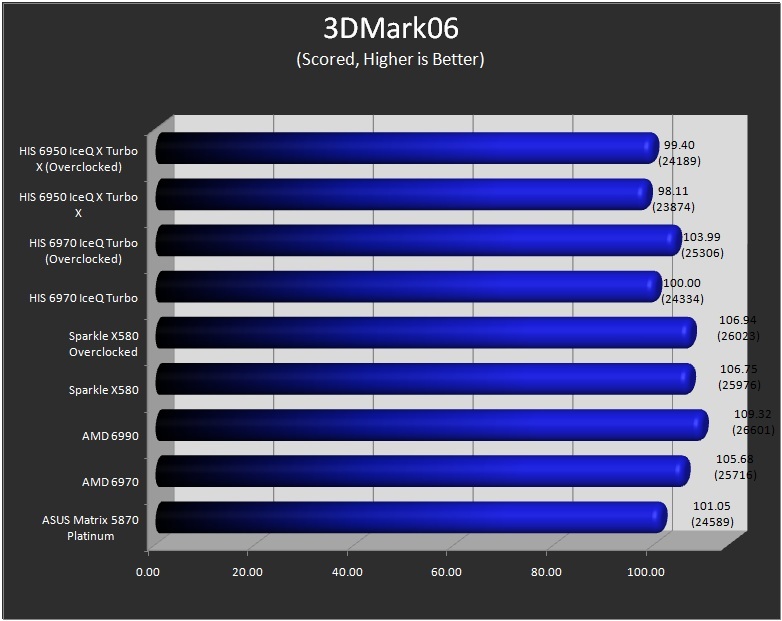 The 6950 we tested here is at the higher end of pricing for the series of cards but also has, by far, the highest stock overclock on the core. You are going to spend at least $30-40 on an aftermarket cooler as well as spending the time to remove the factory cooling and install the new one as well as taking the time to overclock it, so the pricing does fall in line for the 6970. 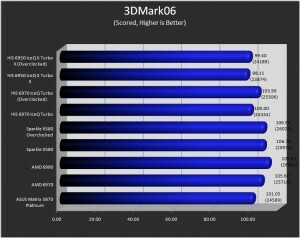 The 6950 does not get the nod for pricing as its nearly $70 more than the cheapest 6950, but if you want quiet and no hassle highly-overclocked performance, that 6950 is for you. 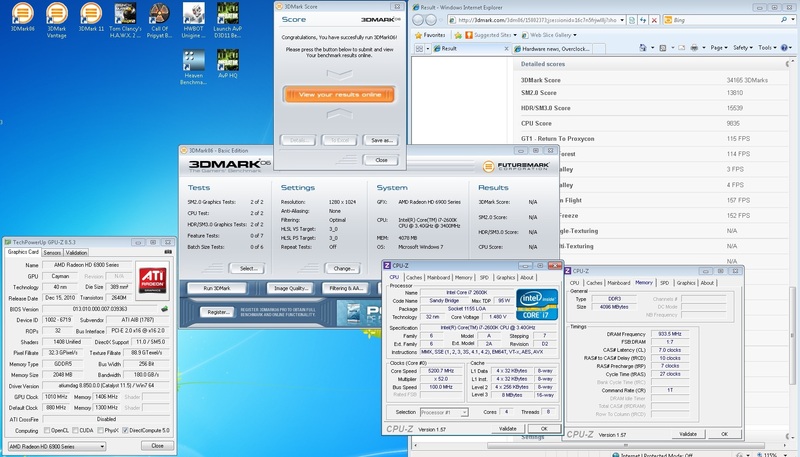 My sample also overclocked to 1000Mhz+ on the core so even after its highest factory overclock, it still kept going. 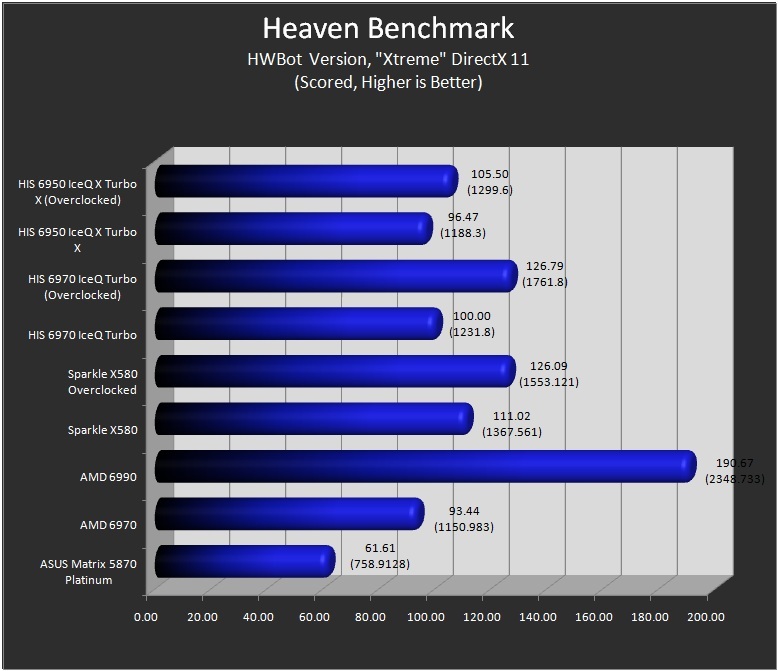 This is actually the highest core overclock reached by Overclockers.com reviewers for the HD 6950. Walking in to these reviews I was a little scared at my initial thoughts on these cards. Personally I am never a big fan of paying for factory overclocks when you can do it yourself for free. These cards however are worth what they cost. Sporting the highest factory clocks out of the box as well as having quiet AND effective cooling solutions are considerations for a lot of buyers. These cards deliver on those wishes. 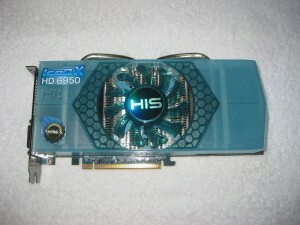 If you happen to be in the market for one of these cards, you should make sure you give the HIS 6950 IceQ Turbo and 6950 IceQ X Turbo X a look. Next Article Navig Does It Again - Project Resilience is Complete! 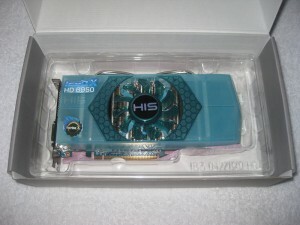 I just bought one of these for my back up gaming system(6950). 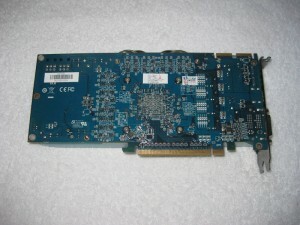 I love the card so far most of the time it runs 40c or less at stock settings. Even when over clocked slightly 900mhz core 1325mhz mem @ 100percent on the fan it never goes over 46c and it is not that loud. 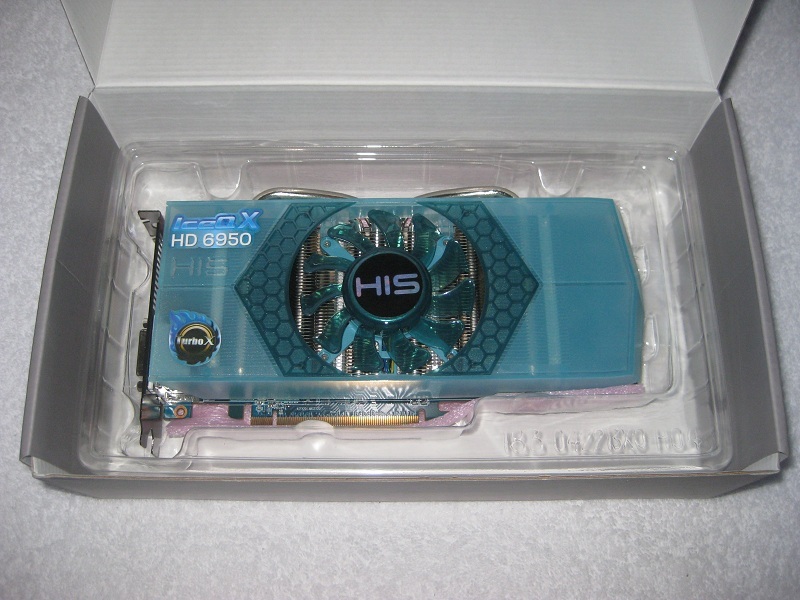 It runs much cooler than my 5870by far. I really think this is one of the best cards on the market. I picked up the 2gb version for 249 after rebate on amazon, and you can get the 1gb version for 229 after rebate. 2 of these cards crossfired for around 500 dollars will kill any single card soultion for around the same price. Price for performance this is one of the best cards I have ever owned.